After a 35 minute train ride, I disembarked at the massive train station in Suzhou and made my way to the taxi line. The heat was sweltering and the line was long and people were trying to squeeze past everyone. Thankfully, taxis were plentiful and there wasn’t much of a wait. A middle-aged man was shouting at one of the guards who initially ignored him but with the way the guy was shouting he probably couldn’t help himself and answered back. They were still at it when I got to my cab. Winding my way to around the town, disappointment was my initial reaction. 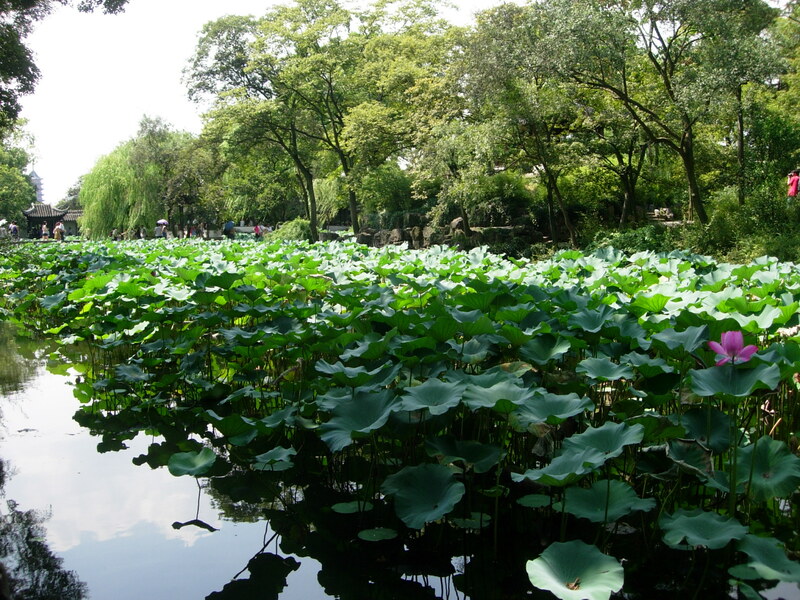 I was expecting parks and greens as I had come to Suzhou for its well-known gardens. Instead what greeted me was a small industrial town with factories and buildings. When the cab turned to away from the main road and entered a small arch, the surrounding seemed better as I started seeing swaying trees and areas of green. The driver finally stopped just outside a small compound and pointed to a building. I doubted him and insisted we were at the wrong street. He pointed to the number (which was correct) but still I insisted as I didn’t seem to see any hostel. I got down and showed the address to the guard and he pointed to an entrance on the side. I paid the driver the RM 12, got my pack and entered the building. 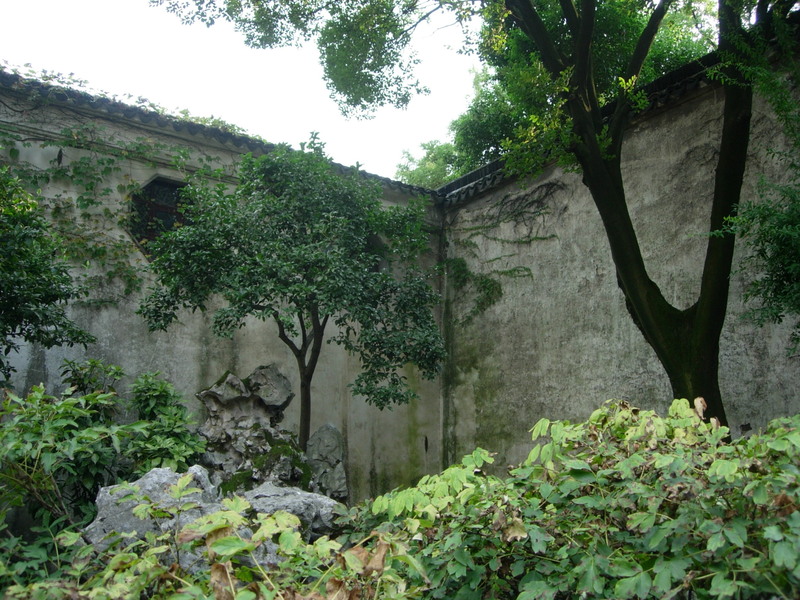 It was indeed the Suzhou Lohas Youth House. It was a really nice place with a large common area and bar with billiards and free internet. Better yet, I was all alone in the 4-bed dorm room and was only paying RM25/bed. It was like having my own single room. The staff at the counter looked like they were still in college and spoke good English. I dropped my pack in the room and headed out to the gardens. It was almost 10 am and I was determined to max out the day as I was heading to Hangzhou the next morning. Disoriented as always, I walked to the direction of the zoo so I had to backtrack a bit and walk to the opposite direction. I passed by several dog grooming shops and there were lots of locals walking cute dogs. They seem to like dogs here. Lion’s Grove wasn’t difficult to find as it was on the first corner and near the tourist office where I got a map. Besides the sheer number of buses parked outside and the hordes of people on tour following the flag of the tour guide is a bigger beacon than any street sign. 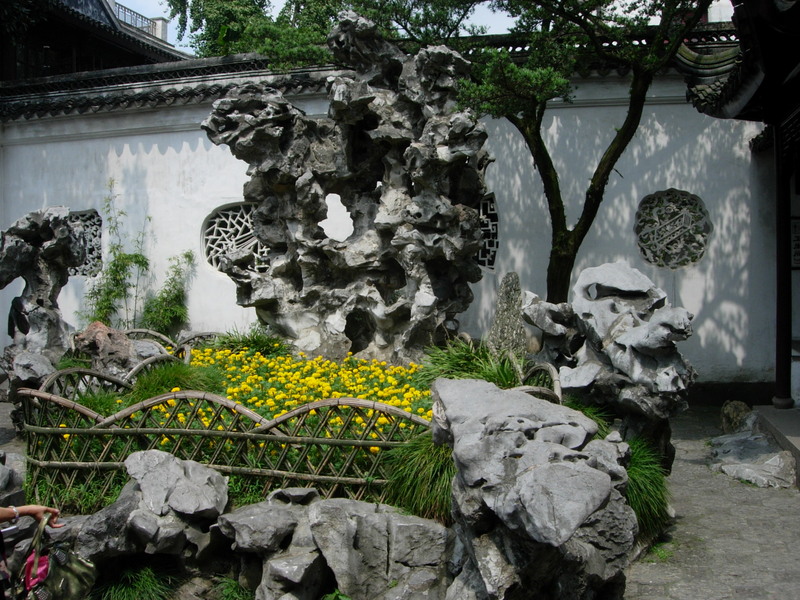 The garden was laid out in 1342 by a monk who named it after his teacher who lived in Lion Rock Mountain which explains the interesting man-made hill made of stone that you climb up and go around like a maze. It was actually quite difficult to get out of it so I just climbed down some parts rather than go through the maze. The garden is huge with lots of pavilions and pools. Unfortunately, not even the immense space of the garden could quite accommodate the many tour groups and the ir noise which detracted from the atmosphere the garden was supposed to invoke. 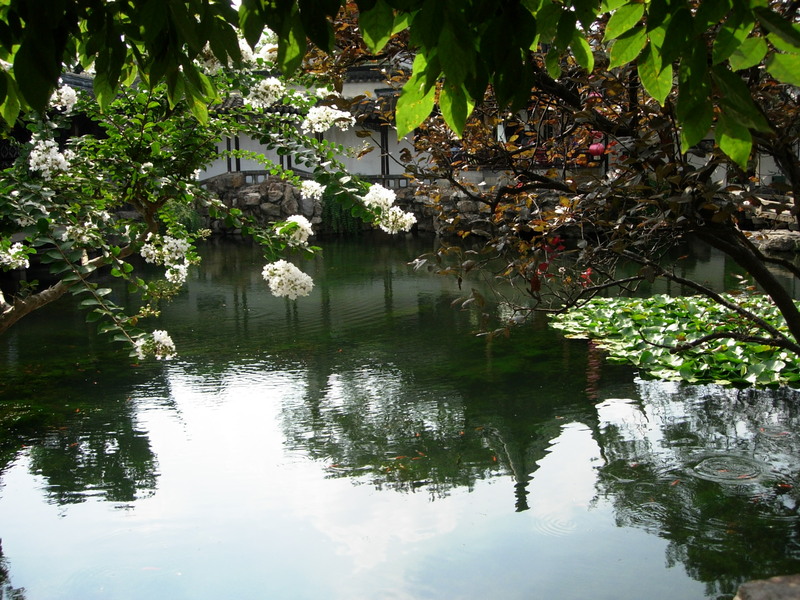 Between the main pavilion and the pond was a stone boat which was placed there to link the land the sea. It was meant to be an element that provides transition between the two. Here I am seated at the stern of the boat with the pond behind me. If you’re wondering how I get that picture, a Japanese tourist asked me to take his picture so of course, I asked him to take mine. This other one is on a stone pathway leading to the exit. Nope, this wasn’t taken by another solo traveler. I simply put my camera on some stones and put it on timer mode. At the garden exit, restaurants lined the road and I entered one which seemed to be run by a family with the mom doing the cooking. I had some braised pork and sweet and sour fish. The servings were good for 2 people and the food was really tasty. The road ended up at the main road from where I turned right to a pedestrian lane where the Suzhou Museum with its white walls is. Unfortunately, being a Monday, it was closed. On the opposite side were souvenir shops selling fans, silk, and other items. I entered a shop selling stuff made out of indigo colored cloth with white designs. I was poking around the shop and could easily have pocketed some of the smaller items as the guy manning it was asleep and snoring loudly. 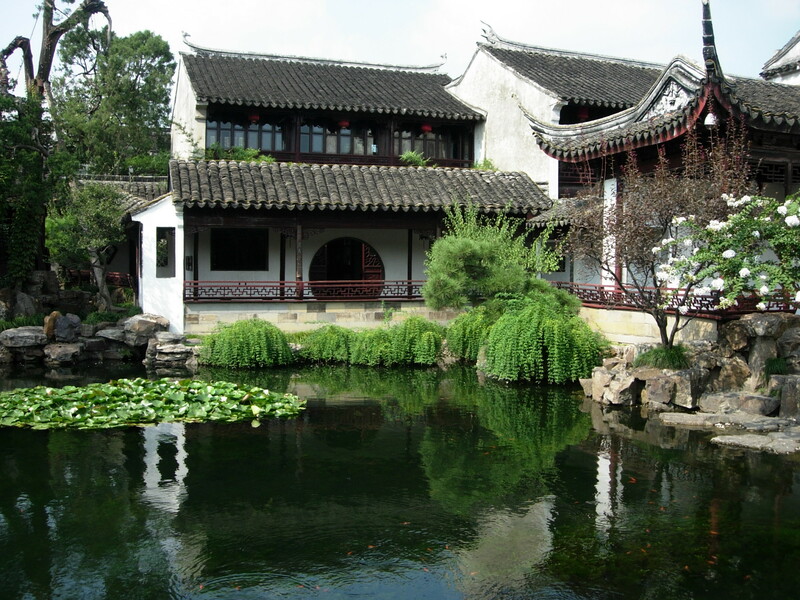 A few meters down the road was The Humble Administrator’s Garden, one of the largest classic gardens and which was built in 1509. There were less people here maybe because it was noon time and the tour groups were having lunch. 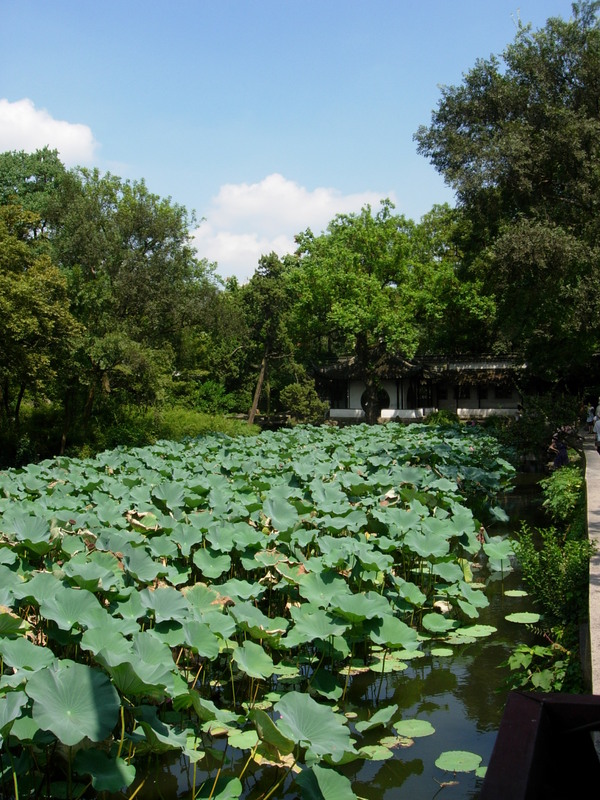 The garden was really big and as you enter, you are greeted by pond filled with lotus. At the center of the garden is a large pool with two islands connected to each other by a zigzagging bridge. My favorite pavilion was the one that had attached small pavilions on each corner of the main pavilion. 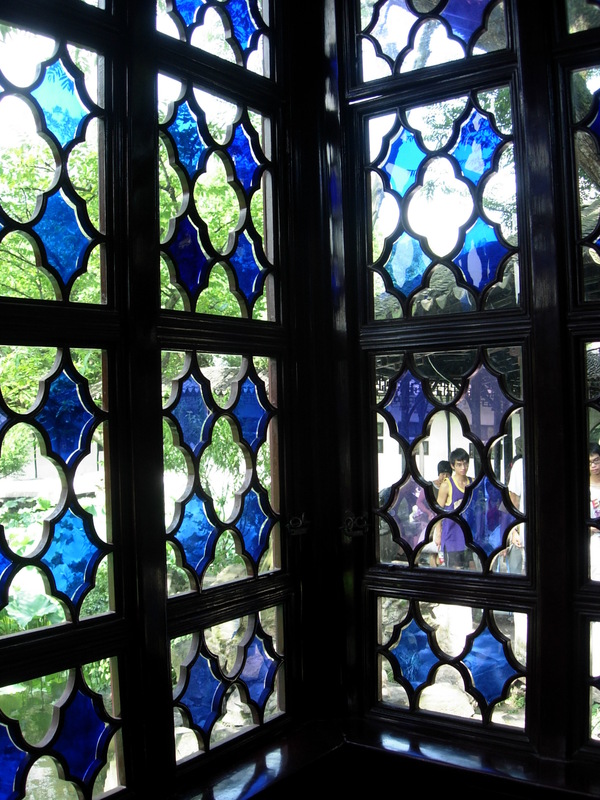 The glass walls were blue and white and with the light streaming inside, it was very beautiful. 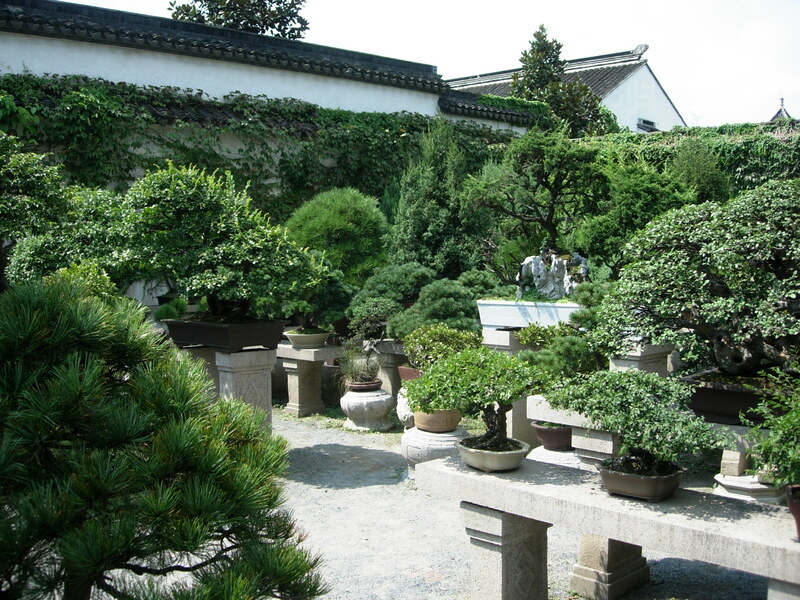 Outside the garden is another garden displaying hundreds of pretty bonsai trees and plants. I accidentally wandered in here as I was looking for my way out. Since the other gardens were too far away to walk to and the heat was really getting in to me, I negotiated a pedal driven tuktuk (I don’t know if that’s what they call it here) for RM 150 to bring to the Master of Nets, the Lingering Garden, the Kunqu Opera Museum, and to the Temple of Mystery. 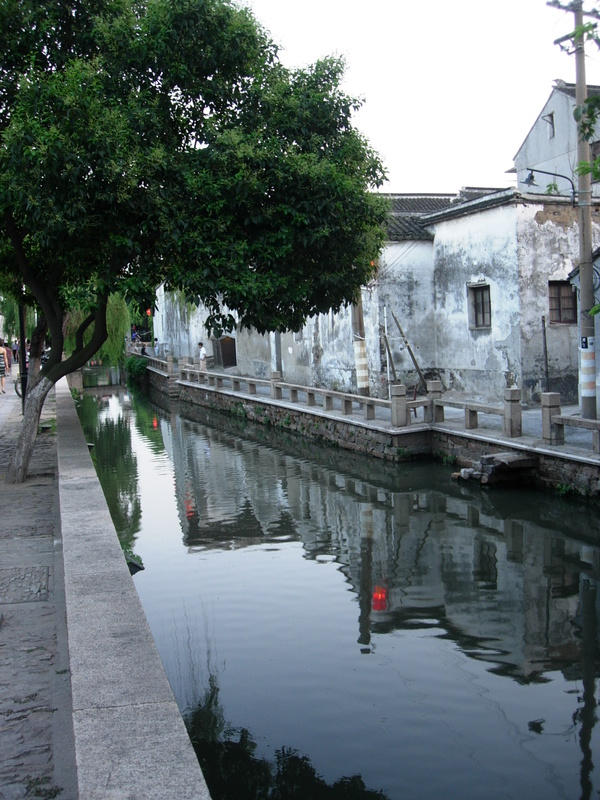 It seemed quite logical to go to the Lingering Garden first as the map showed it was the nearest but the driver brought me to Pungjiang Street first where the Kunqu Opera Museum is. 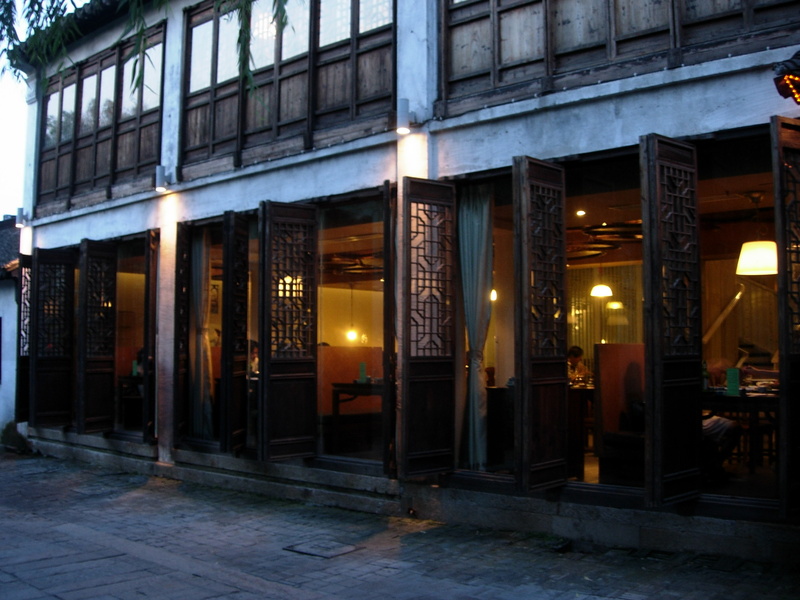 Pungjian is a preserved traditional street where houses and shops still retain the traditional architecture. As we made our way along the narrow street, the driver would fold the tuktuk’s canopy at certain parts just so we could pass. There was no one at the museum except for a bored security guard who looked surprised when I came in. 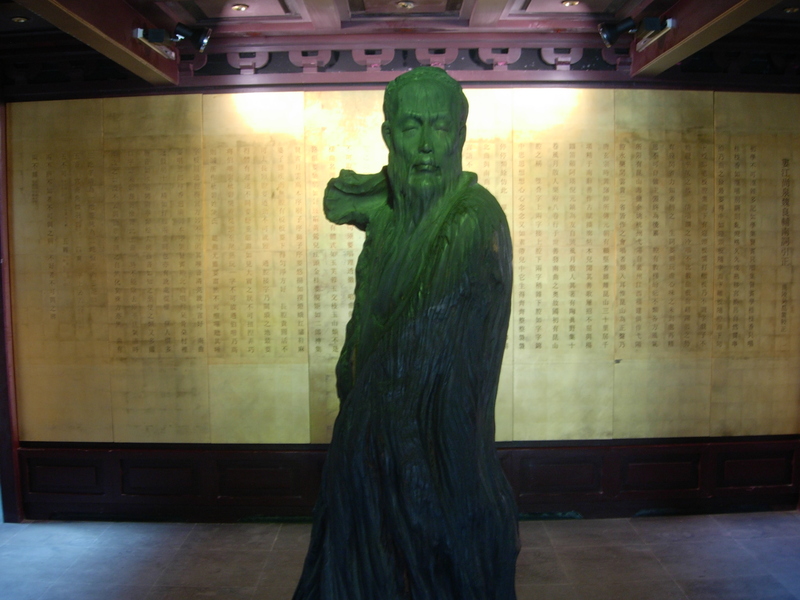 The front part of the museum has displays of window carvings showing scenes from the opera and a big statue of a Chinese opera master. 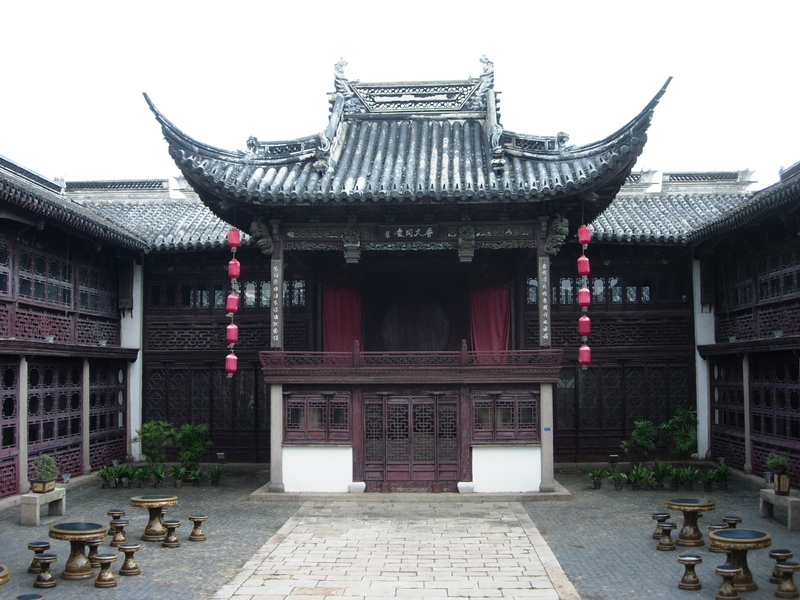 The real gem is the traditional opera stage at the central courtyard which was built during the Ming Dynasty. Overlooking the courtyard were corridors lined with tables and chairs. I can imagine how fun it would be to watch the antics of the Monkey King at the beautiful stage while sitting under the stars. in the courtyard Opposite the stage was a small air-conditioned theater where shows are apparently held. It was a little modern with sound systems but the seats were still the old set-up of wooden chairs and tables. 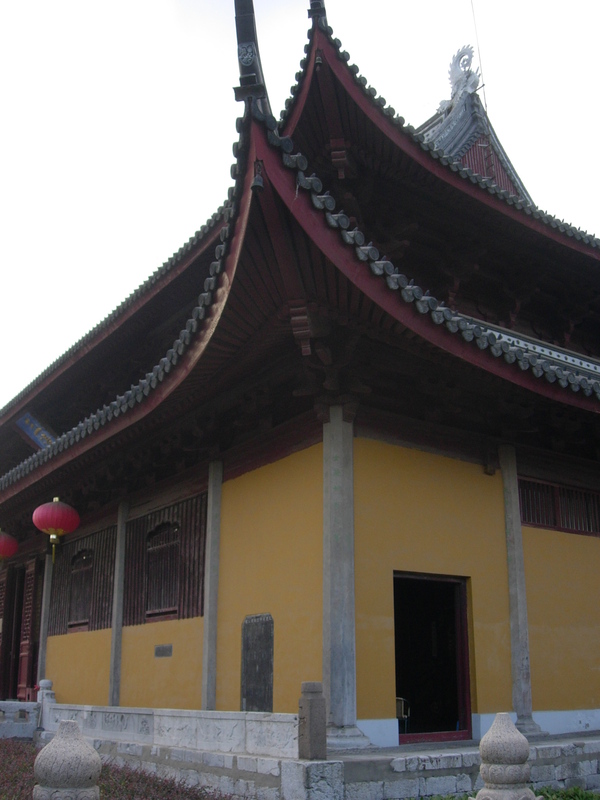 Suzhou, being the historical home of the Kun Opera style, I was a bit surprised that the museum seemed quite neglected. Nearby was a row of stalls selling some souvenir items and antiques of dubious progeny and authenticity. I bought a tiny pair of shoes carved from bone. There were other interesting stuff such as folding slabs carved with love-making scenes from the “Pillow Books”, opium pipes, and some bronze figures; but they weren’t fascinating enough for me to part with my yuan. It was a short ride to the Master of Nets Garden. This was just a small one but my favorite maybe because there were no tour groups, just people visiting the garden on their own. 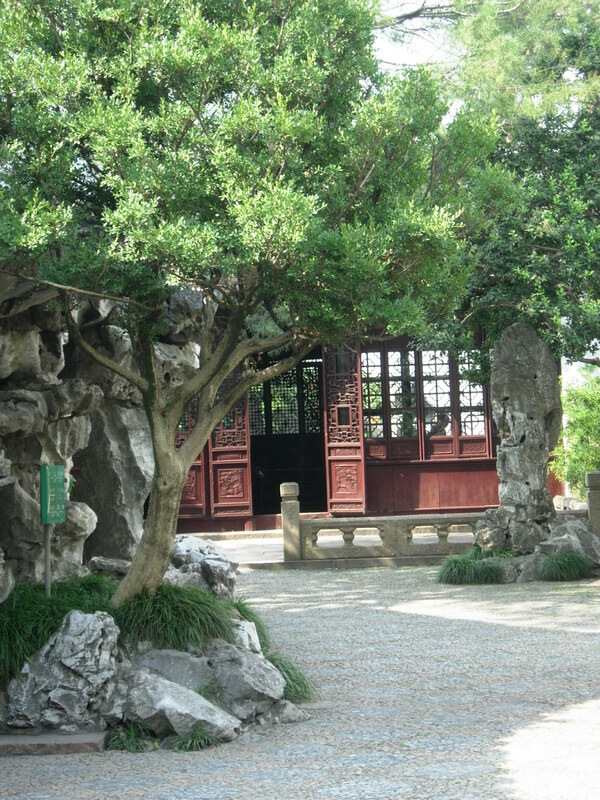 According to my Rough Guides China book, it is considered by many to be one of the finest gardens and I could see why. 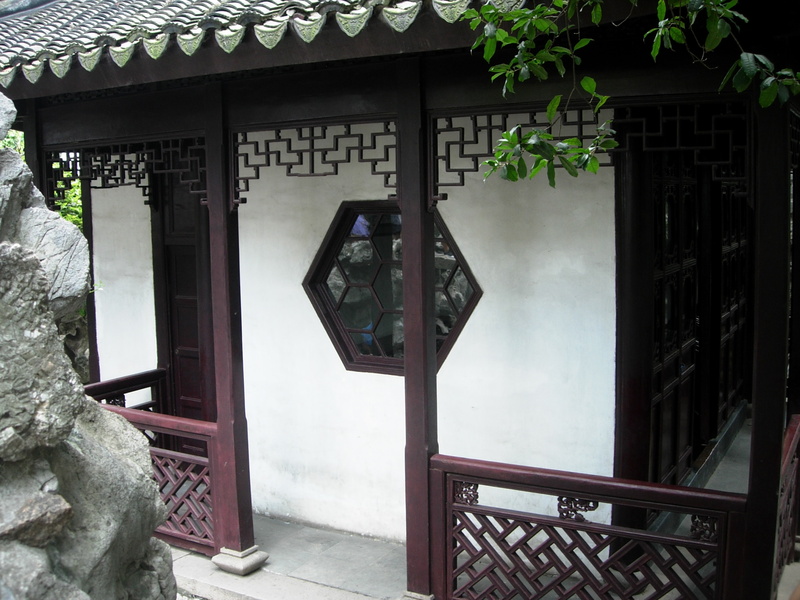 The pavilions were simply lovely with their fine lattice work and delicate interiors. One particular spot I liked was an low artificial hill made of stone that had steps leading to a study. 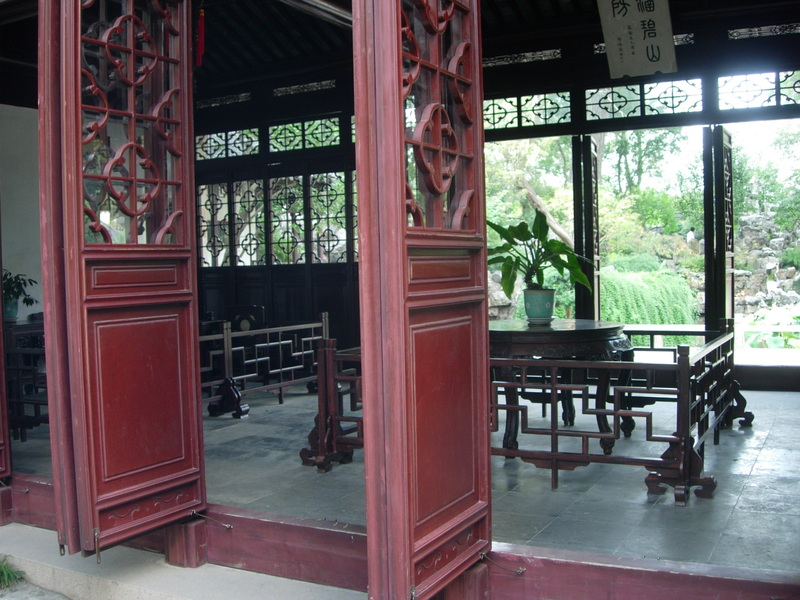 As you go in them, especially in pavilions used as studies, you get an insight into the contemplative nature of Chinese scholars. One study had beautiful views of the pond and the surrounding greenery. Alone in a pavilion I can’t help imagining myself in a richly-embroidered robe bent over a scroll and practicing my calligraphy. We had to go through the main road with all the buses and the cars to get to the Lingering Garden which was a long way off. I pitied my driver as the sun was blazing hot and I was heavy and he had to pedal amongst the motoized vehicles. Fortunately, there were some lanes reserved for bicycles. We were in the busy commercial area where malls, modern shops, and big hotels were. Finally leaving the main road past a condominium development project which had traditional architectural details, we reached the garden. I was a little disappointed at this one as I expected a really nice garden that would encourage you to linger, as its name suggests. The buildings were nice though but the layout of the garden was pretty bland compared to the others. 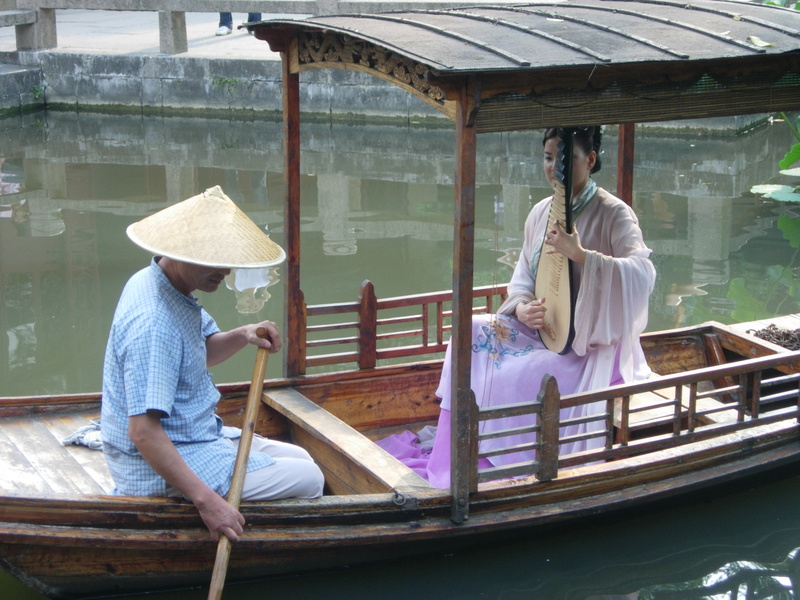 However, there was a pavilion where an opera performance was though it seemed a bit amateurish and at the pond a prettily made-up girl dressed in a flowing robe played the pipa while a guy rowed the boat. The driver dropped me off at the pedestrian street of Guanquian Jie where two other smaller gardens were supposed to be within walking distance and where the Mystery Temple is. After all the greenery, it was a bit of a shock to be surrounded by shops this time. I guess every tourist town must have a pedestrian street for tourist retail therapy. Guanquian Jie ran perpendicular from Renmin Lu to Lindun Lu. There were more modern stores selling street fashion, KFC and Mcdonald’s though than souvenir shops. The only interesting ones were the food shoppes which werre selling a variety of snacks. 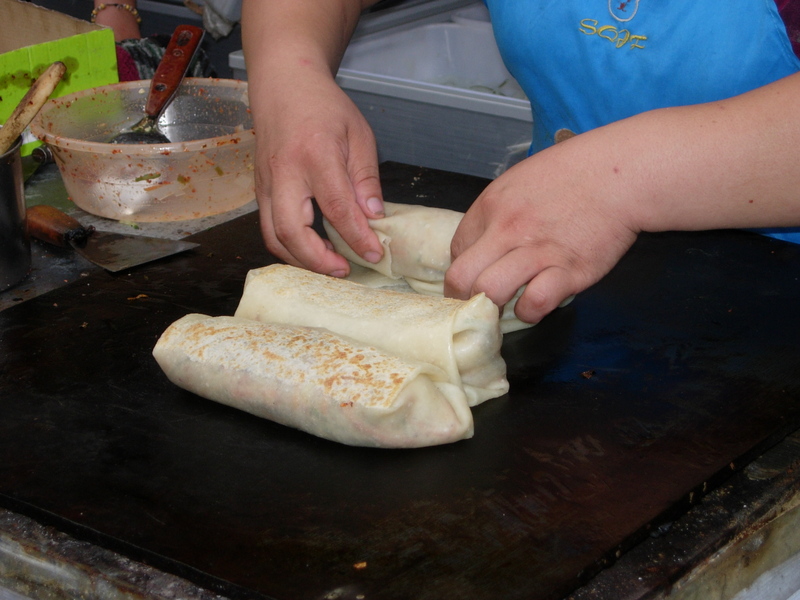 One side street had two food stalls of which was selling something that looked like large spring rolls filled with vegetables. . 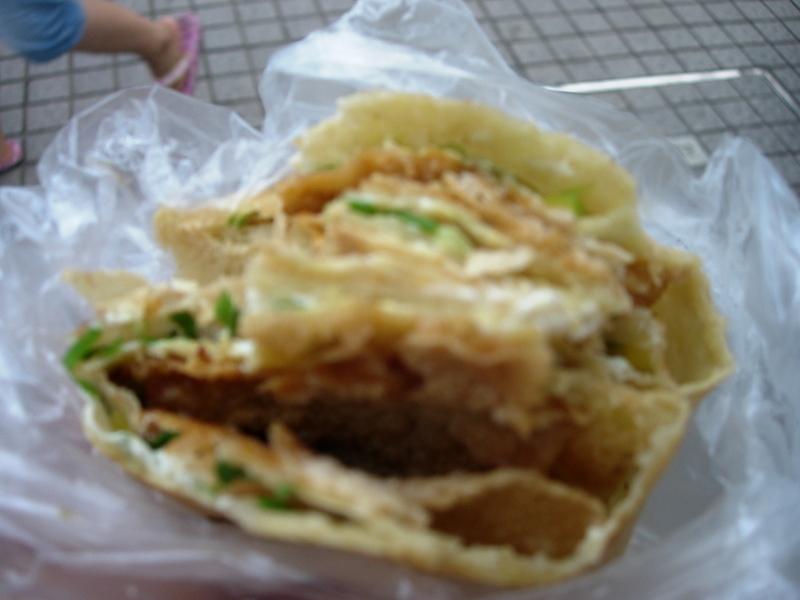 There was quite a wait so I transferred to another stall which was selling a crepe-like snack. It tasted quite good really. 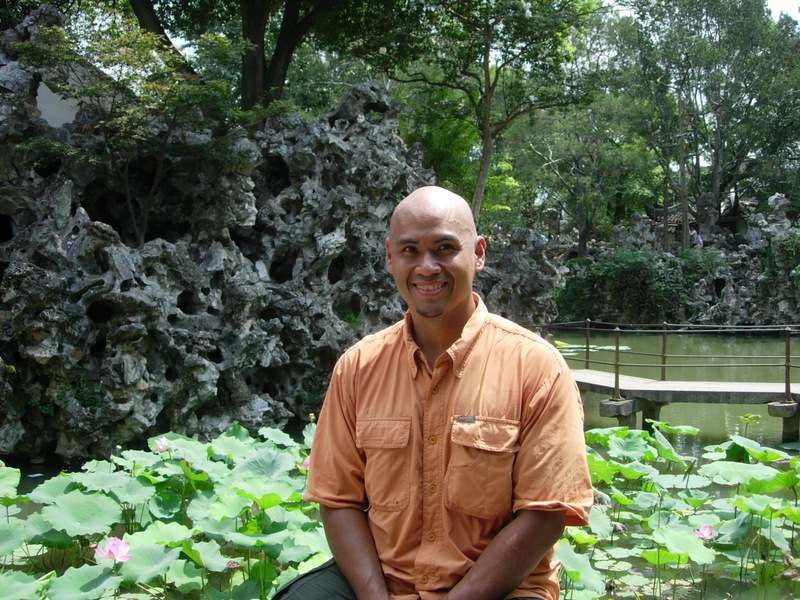 The Mystery Temple is surrounded by a park with resting locals and a row of shops. It has always been the scene of a bazaar showcasing various wares and traveling performers. So it’s not surprising that it’s located on the center of the pedestrian commercial center. 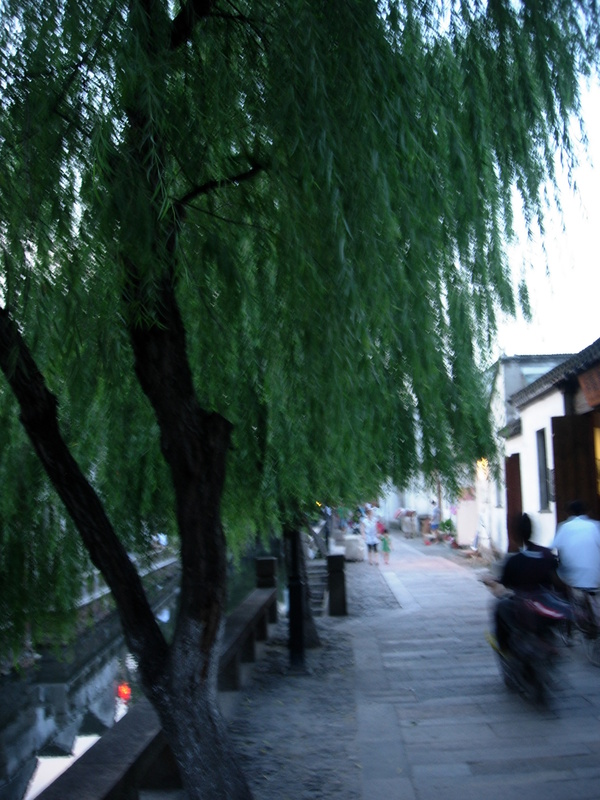 It was a short walk to Punjiang Street. It was dusk already and most of the tourists were gone. 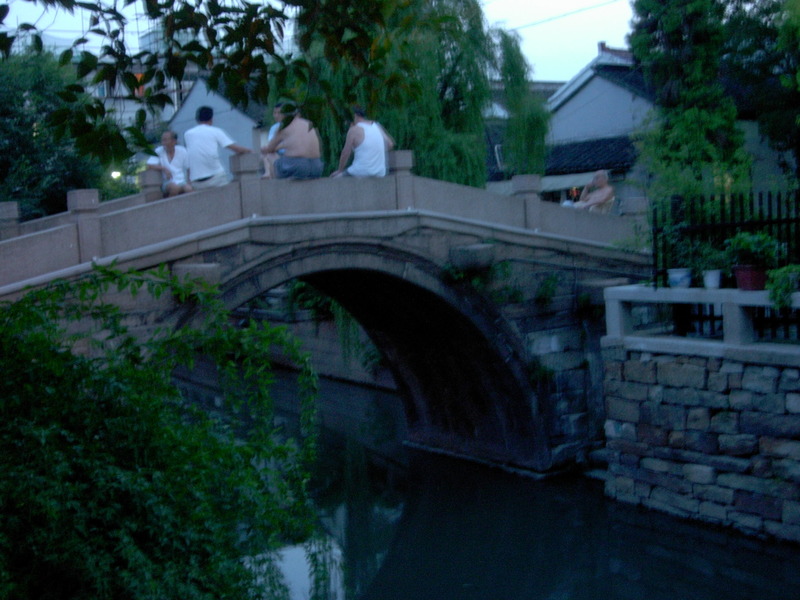 Much of the foot traffic were of locals heading home or just hanging out at the many stone bridges. 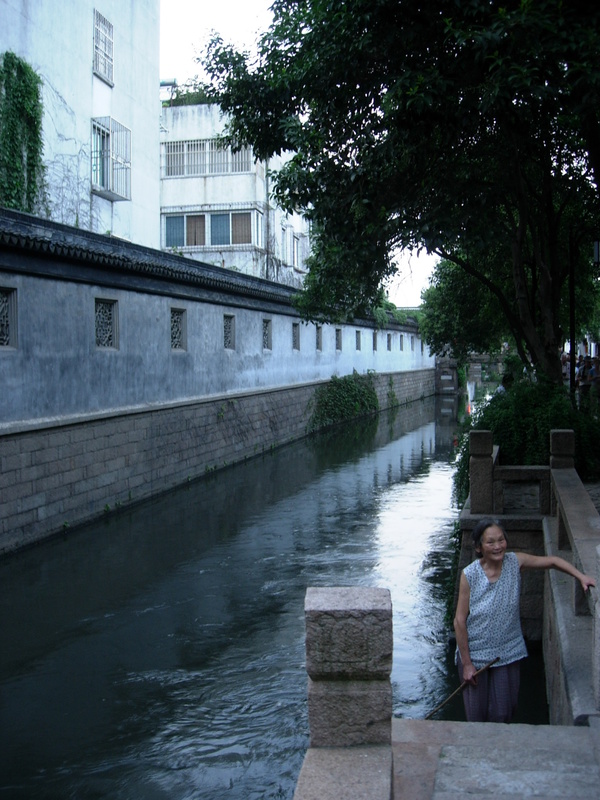 One woman was at the canal and seemed to be fishing with a long bamboo pole. I dropped into a small cafe-store that was selling unique postcards and serving tea. There were lots of little bars and cafes where it would be nice to just sit back and watch the world go by. It was a pity that most were empty though. 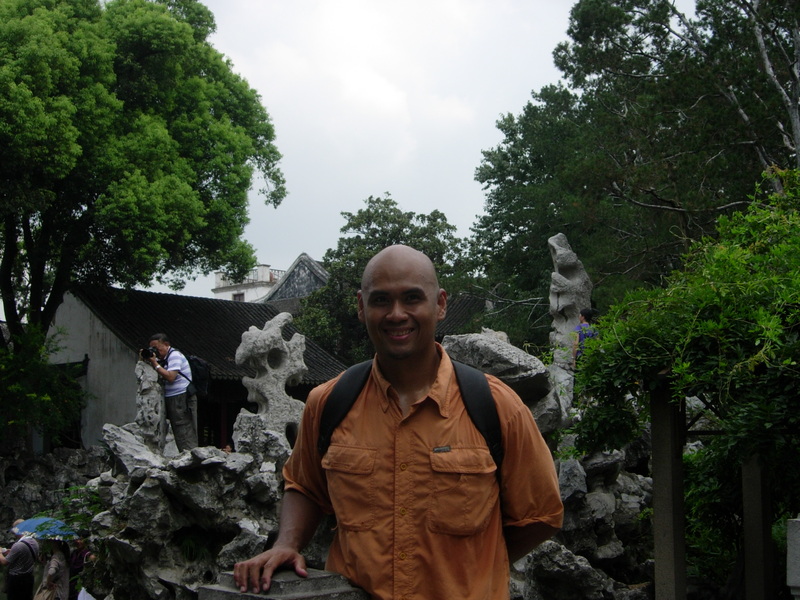 I met up with a Filipino who’s been teaching in China for four years. We had dinner at a Chinese restaurant a few hundred meters from the hostel. The entire first floor was a smoking area so we were brought to the second floor where we had a small room that had a table for six. It was an experience dining in your own private room. I mentioned to him that I used to teach college in English years ago. He looked at me in surprise and told me that the girl he had been texting earlier had been looking for an English teach to handle a class for the next few days. He called her and told him about me. I was to give my resume and go for an interview the next day and if I pass, they can extend my visa, teach, and eventually go permanent. It was a tempting offer that I couldn’t take of course. Back at the hostel, there weren’t much people still. I hanged around at the bar with a college kid from the UK who was traveling back to Shanghai the day after next for his flight back home. I went back to my room close to midnight only because UK kid said he was heading to bed. No one had yet checked-in at the dorm so I still had it all to myself. 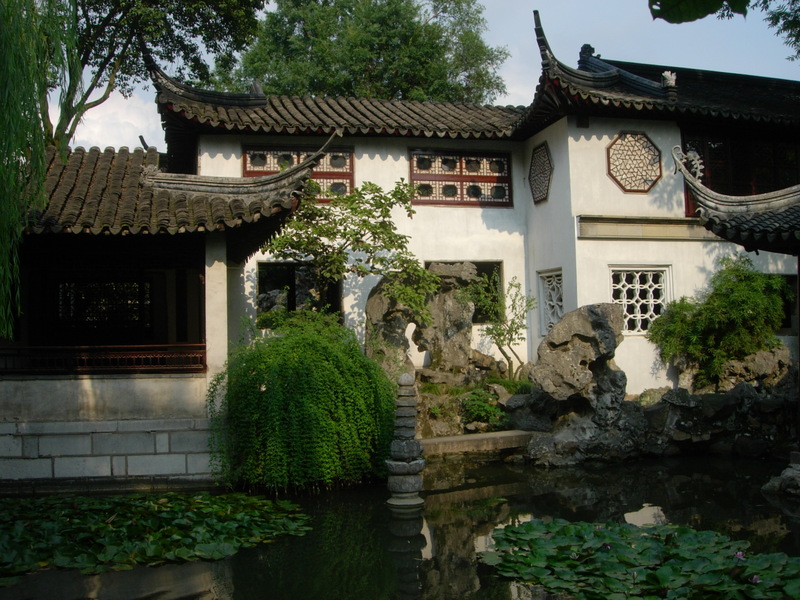 I still hadn’t fully explored Suzhou but what the few gardens I visited were really beautiful and gave me some understanding of Chinese landscape aesthetics. I like how they planned the gardens around the elements of the earth and how they are linked with each other. Going around the garden, you stumble on pockets of silence where you can just sit and ruminate away from the madding crowd. 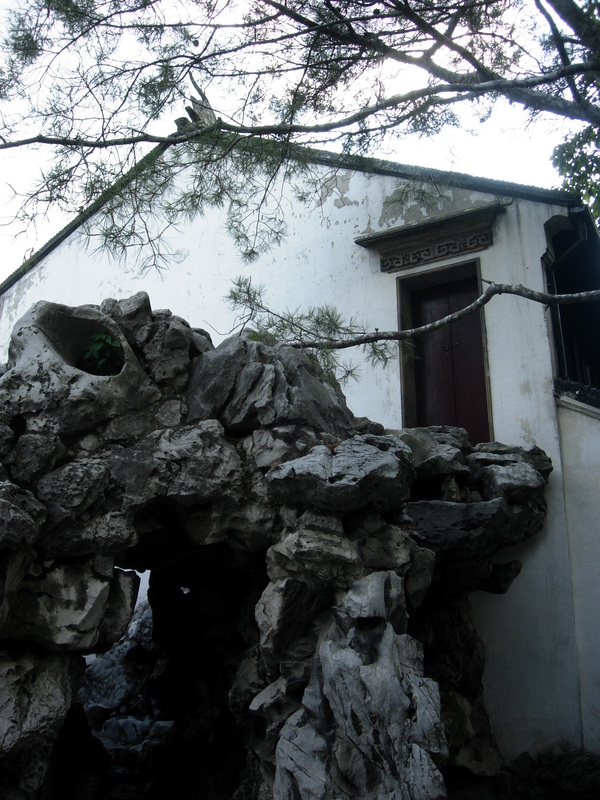 I guess that’s what Chinese gardens are all about—finding your own space.